Printable recipe at the bottom of the post! A Brownie Bombe with a chocolate brownie shell, three kinds of ice cream layers of dark chocolate ganache, and a whipped cream icing. Hey. Sometimes I just crave ice cream! 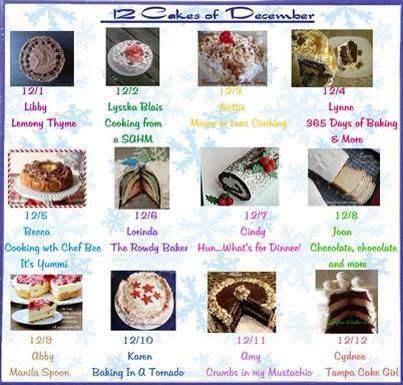 When Amy from Crumbs in My Mustachio came up with the brilliant idea to post a Christmas cake each day made by twelve different bloggers, I jumped right in. I may have even muscled other people aside in my enthusiasm. What a blast! I dithered over this to a ridiculous degree, considering and discarding all different kinds of recipes. And even though my final choice wasn’t technically a cake, it’s a refreshing and crowd-pleasing dessert for any time of the year! 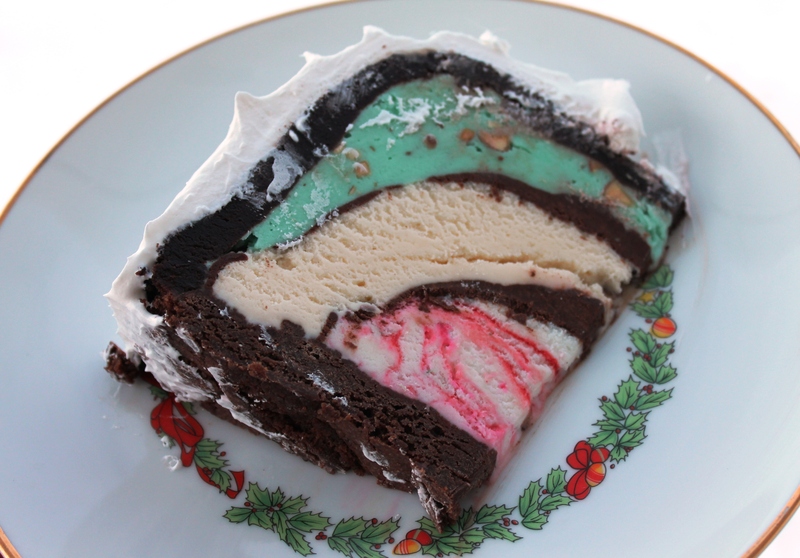 I used pistachio-almond, vanilla, and peppermint ice cream for a traditional Christmas color scheme. You may use any flavor or color that appeals to you, of course. 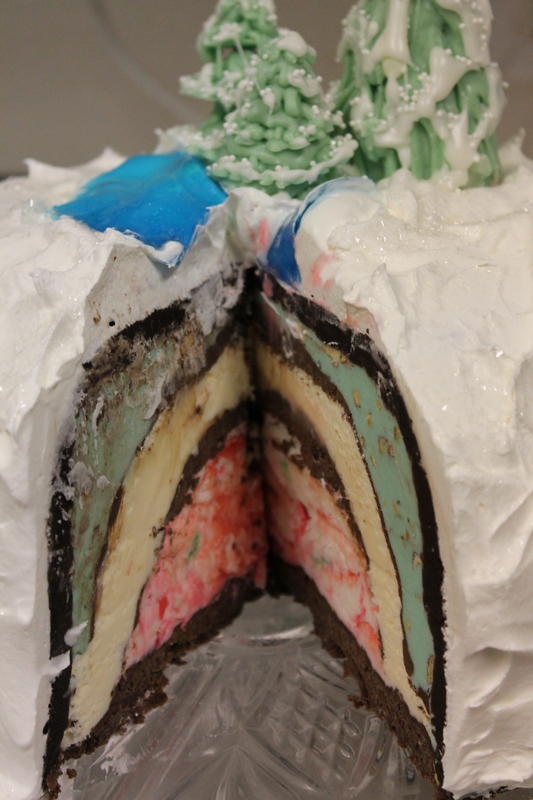 I also put ganache between the ice cream layers because…well…because I love ganache! This is optional. It’s one more step, but I love the way it delineates the colors. 2 batches of brownies. Guard them with your life; you will need ALL of the brownies. Trust me on this – I had to make a third batch because I let the guys “test” them. 10 ounces of dark chocolate. Good dark chocolate, not chips! A large tub of non-dairy topping. I usually avoid this stuff like the plague, but it holds up so much better than whipping cream that I caved it this time. Begin by baking the brownies. Chewy or cake brownies? Doesn’t really matter. Cool them thoroughly. Line a bowl with foil, smoothing it out as much as possible. Don’t lose any sleep over this; the weight of the brownies and ice cream will flatten out most of the little ridges. Firmly press large brownies all over the bowl, covering the foil completely, and bringing all the way to the top of the bowl. Save enough to cover the top when you’re done! Press brownies along sides and bottom of bowl. Stick the bowl in the freezer for an hour. This is the perfect time to make your ganache if you’re using it. Chop 10 ounces of dark chocolate and put it in a medium bowl. Heat 1 1/4 cups heavy cream until it’s beginning to bubble but not boil. Pour the hot cream over the chopped chocolate. Let it sit for a couple of minutes, then stir gently until it is blended. Cover and set aside to cool. Give it a stir occasionally. When the hour is almost up, bring out your first carton of ice cream and allow it to soften. I can tell you through experience that you don’t want to try to flatten lumps of frozen ice cream. Let it soften, and maybe stir it around in a bowl first. It will make the next step a LOT easier! Press the ice cream (yes, the whole carton) over the brownie layer, bringing it almost to the top. Leave a generous 1/2″ at the top, because there will be a brownie “cover” added at the end. Smooth the ice cream as much as possible with a spoon, rubber spatula, or (brrr) your fingers. Return the bowl to the freezer. Add ice cream flavor #1. When the ice cream layer is firm, pour enough ganache into the bowl to coat the ice cream. 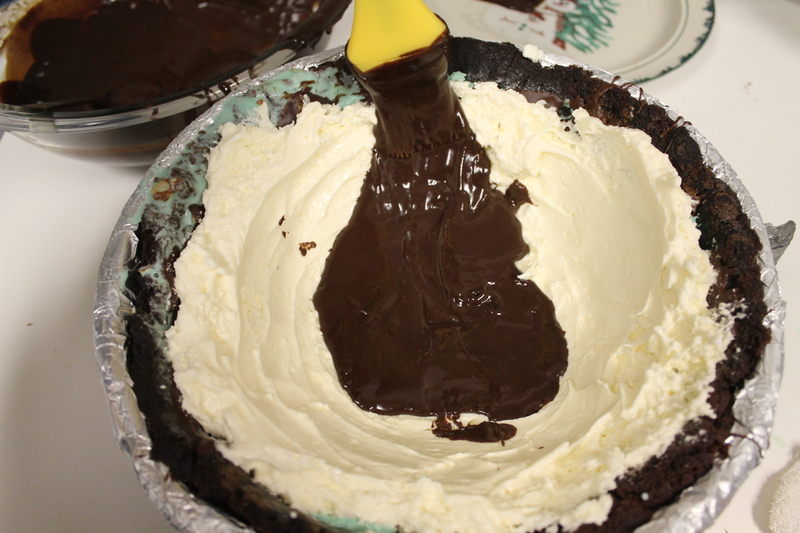 Tip and rotate the bowl to spread the ganache, or use a pastry brush. Work quickly so the ice cream doesn’t melt! Return to the freezer. Soften the second tub of ice cream. Spread over the hardened ganache in the bowl and (you guessed it) return it to the freezer. When firm, repeat the ganache layer and freeze again. Fill with the remaining ice cream. (You’ll have a little left over. Grab a spoon; you know what to do with it, right?) Return the bowl to the freezer. Cover the ice cream with the remaining brownies, pressing firmly. 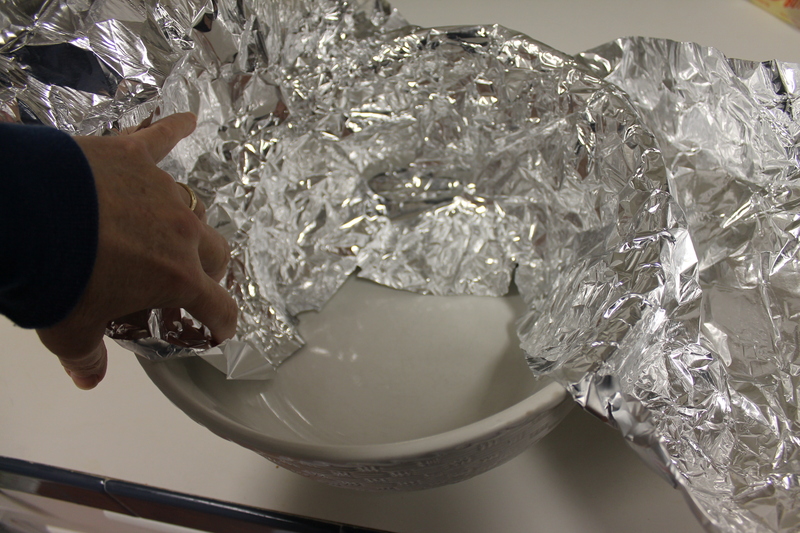 Cover the bowl with foil, and freeze until solid. (Overnight is best.) When you’re ready to serve, remove the foil from the top, cover the top of the bowl with your platter, and flip it over. Peel the foil off of the bombe and frost it with whipped topping. Frost it with whipped topping. Sprinkle with sparkly edible glitter, add chocolate shapes, cookies…whatever is appropriate for your theme, or just leave it a beautiful fluffy white. Slice and serve! Use a knife that’s been dipped in warm water if your bombe is hard to cut. If you have any left over, put it in the freezer until the whipped topping is firm, and then cover well with heavy foil. Line a large mixing bowl (mine was about 4 quarts) with foil. Firmly press brownies over the inside surface of the bowl, reserving enough to cover the top at the end of the process. Put the bowl in the freezer for an hour. While it's freezing, make your ganache. Heat 1¼ cups heavy cream until it's beginning to bubble but not boil. Pour the hot cream over the chopped chocolate. Let it sit for a minute or two, then stir gently until it is completely blended. Cover lightly and set aside to cool, stirring occasionally. When the hour is almost up, put your first tub of ice cream on the counter to soften. You may want to stir it in a bowl so it is evenly thawed. You're looking for soft, not runny! 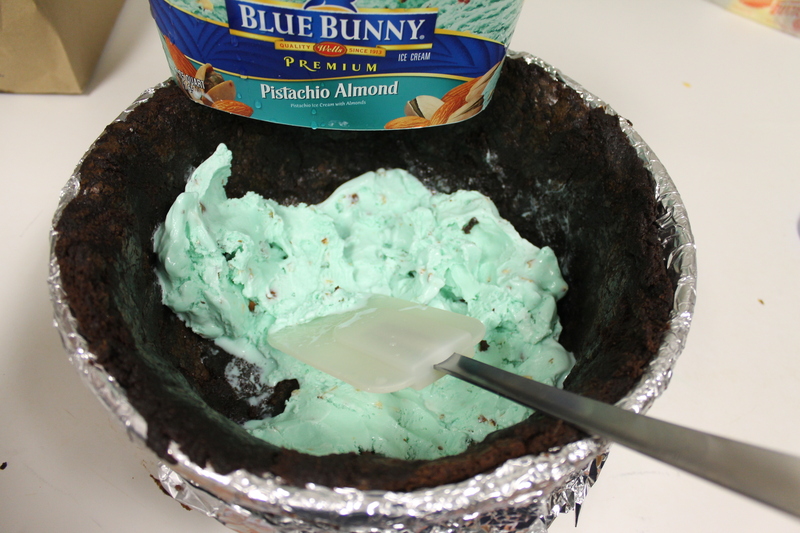 Remove bowl from freezer and press the entire carton of ice cream over the brownie layer, bringing it almost to the top. 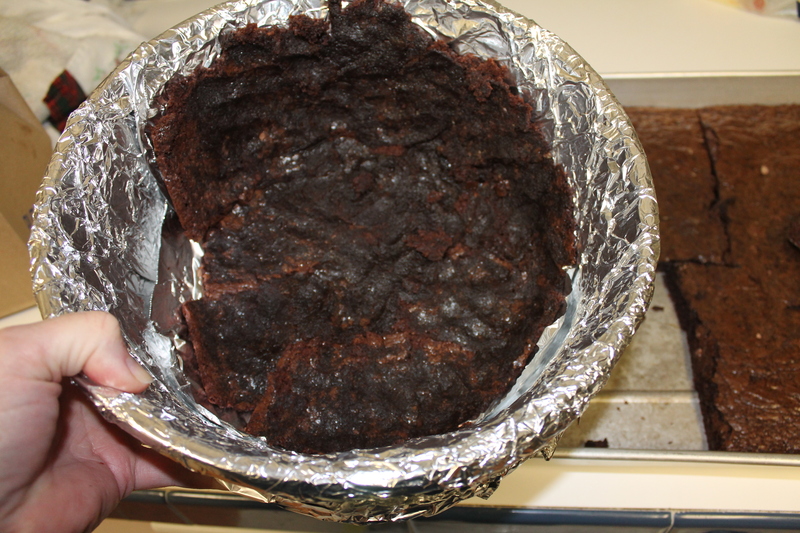 Leave at least ½ of brownie showing around the top of the bowl. Working quickly, smooth the ice cream as much as possible. Return the bowl to the freezer. When the ice cream layer is firm, remove from freezer and pour enough ganache into the bowl to coat the ice cream. Tip and rotate the bowl to spread the ganache, or use a pastry brush. Return to freezer for at least ½ hour. Bring the second tub of ice cream out to soften. Spread over hardened ganache. (You may have a little ice cream left this time.) Return to the freezer. When firm, repeat the ganache layer and return to the freezer. Soften the third tub of ice cream. When the ganache is firm, fill the rest of the space with ice cream and return to the freezer. When the ice cream is firm, cover with the reserved brownies, pressing firmly. Make sure all of the ice cream is covered. Remove the foil from the top and turn the bombe over onto a serving platter. Peel off the foil and frost with whipped topping. Cut with a knife dipped in warm water. To freeze remaining bombe, put it uncovered in the freezer until the whipped topping is firm, and then cover with heavy foil. Here are the links to the first five cakes. 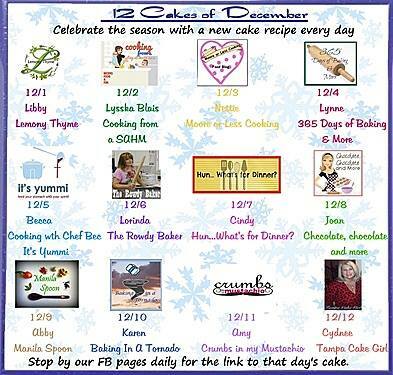 I’ll add a link for each new cake, so make sure you come back and visit each day! 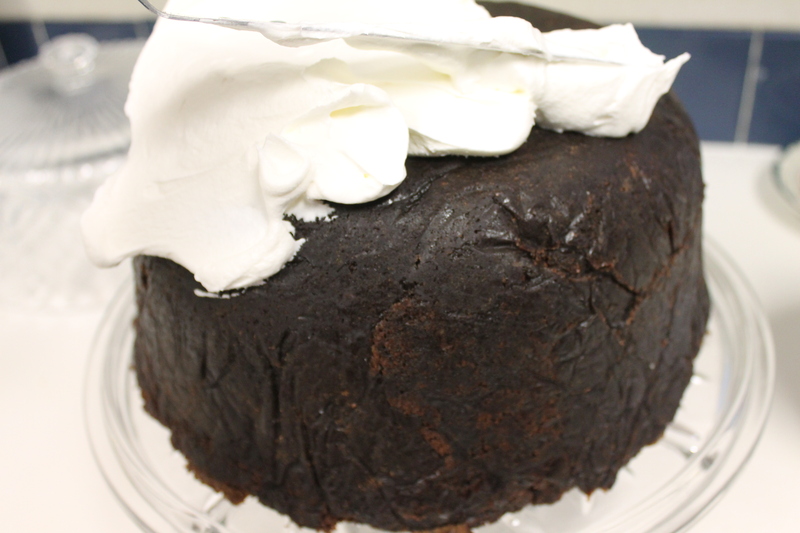 December 6th: My Brownie Bombe. December 7th: Hun What’s for Dinner’s Chocolate Roll with candy cane whipped cream. December 8th: Chocolate, Chocolate and More’s Eggnog Pound Cake. December 9th: Manila Spoon’s No-Bake White Chocolate Cranberry Cheesecake. December 10th: Baking in a Tornado’s White Chocolate Peppermint Cake. December 11th: Crumbs in My Mustachio’s Hot Cocoalicious Cake. December 12th: Tampa Cake Girl’s Red Velvet White Chocolate Cheesecake. I hope you’ve enjoyed our twelve cakes as much as we enjoyed presenting them! 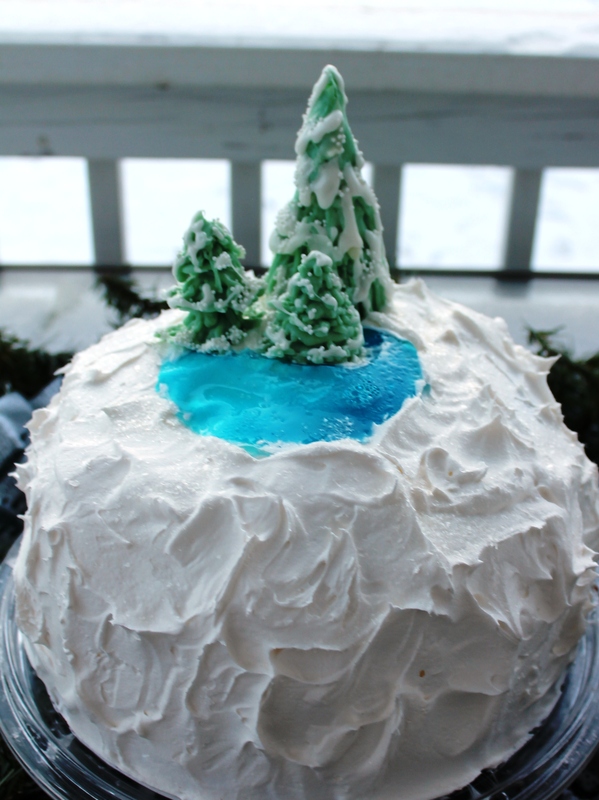 This entry was posted in Cakes, Desserts, Holidays and tagged bombe, brownie bombe, christmas desserts, ice cream cake by Lorinda. Bookmark the permalink. Thanks, Becca! Make it, make it, make it! Absolutely beautiful. My kids are going to love this. And they’ll be my excuse for making it because I’m going to love this! Thanks, Karen! Just think of all the possibilities! You could do a core of peanut butter dough, fresh fruit, so many options. Thank you! It was so much fun to make. Yay, Nettie! I could see it for July 4th, though you’d probably have to dye vanilla ice cream blue. Oh so pretty! Oh so clever! And, I imagine, oh so delicious! I appreciate how you make fancy-looking dishes so achievable by us common folk. Oh, so sweet, Mary Rose. Thank you! This sounds amazing … I just showed it to the Girl–she declared “If you made that for my birthday cake, that would be so perfect!” So this will be her bday dessert in 2 weeks!! I just need to use GF brownies!! Awesome! Hope she has a big party, ’cause this is a lot of cake! We’ll have 24 family members here … so I think we’ll make good work of it! She LOVED this … actually, EVERYONE loved this!!! Such a hit!